ITEMdesignworks won the Red Dot Award: Product Design 2019 for the design, conceptualization and development of Karbon Chair for Actiu, an international furniture manufacturer. Karbon Chair has been awarded with this recognized prize due to its design, high quality and innovation. The Red Dot Award: Product Design is one of the largest design competitions in the world. In 2019, designers and manufacturers from 55 countries entered more than 5,500 products in the competition. The international jury, composed by experts in different disciplines, has been meeting since 1959 to select the best designs of the year. “In search of a good design and innovation” is the motto that defines them. For this reason, they look for a high level of innovation, functionality, formal quality, longevity and ergonomics in the winning designs. This year 2019, the jury has recognized that Karbon Chair meets these requirements to be catalogued as an exceptional design and has been granted a Red Dot. The awards ceremony will take place on July 8, 2019 at the Aalto Theater in Essen in Germany as part of the Red Dot Gala. 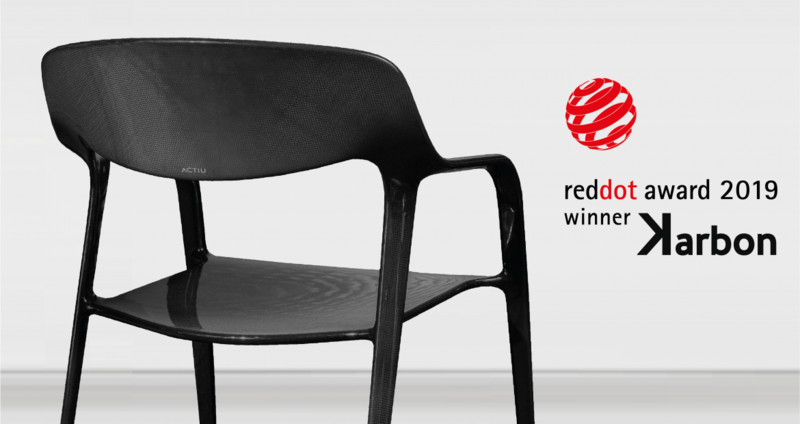 Karbon Chair will become part of the official yearbook of the Red Dot award winners and will participate in the exhibitions held both in its Museum in Essen and around the world. The KARBON chair for Actiu a company from Alicante (SPAIN), is the first chair designed and developed in carbon fiber in Spain and of the few in the world. The KARBON chair supposes a total change of mentality when incorporating materials that move away from the traditional. KARBON offers organic forms with excellent finishes, textures and nuances of endless brightness. One of its features is the weight of the chair: only 3 kg, an extremely rigid piece, but light, the result of having been designed entirely in carbon fiber. In short, it is a chair that stands out for its: smart and timeless design, warmth, technological perfection and lightness, an authentic vision of the future.